Lee Hornbeck killed this unique Upstate, SC buck on Nov. 17, 2018. 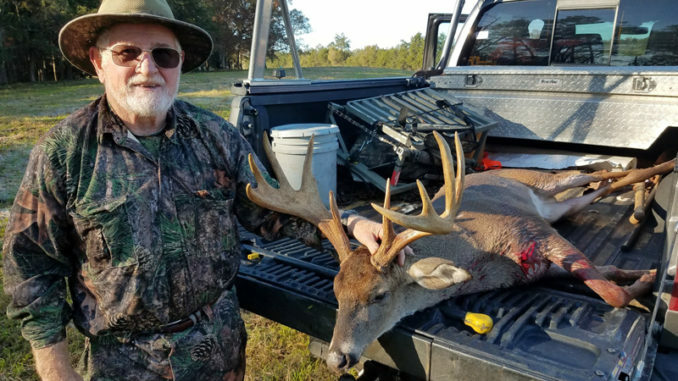 Lee Hornbeck of Greenville, S.C. killed a buck that had a very unusual rack on the morning of Nov. 17. It’s a buck that was picked up on trail cameras for several years on the Greenville County farm near the old landfill off Hwy. 14. But nobody had ever seen the deer in daylight until the day Hornbeck killed it. The trail cam photos showed the buck’s distinctive rack, which featured palmated beams and flat antlers. The rack looked like two open hands with very long, flat fingers. “We’ve been hunting him for over three years, but nobody had ever actually sent the deer. The farmer was out there every day with his cattle, and even he had not seen the deer,” said Hornbeck. Hornbeck climbed up about 25 feet with his climbing stand. He could see over the trees and brush in that area of the 800-acre farm. It was a crystal clear morning, and the temperature was right at freezing with the first frost of the fall. “I was overlooking a bottom area next to the landfill. There was a large field there about 100 yards across. Suddenly, this deer came running across that field toward the woods where I was sitting. I ‘baahed’ at him several times to try to get him to stop, but he was not interested in stopping. He was moving on,” he said. But Hornbeck wasn’t about to let the buck slip away. When the deer was about 100 yards away and running parallel to Hornbeck, the hunter pulled the trigger on his .257 Weatherby, which he bought in Germany 52 years ago. The round tore right through the heart and lungs, but the buck managed to run another 75 yards or so, breaking through several strands of a barbed wire fence before dropping. The gross green score on the 10-point rack was 147 3/8, with a net score of 135 7/8 after deductions. The inside spread measured 17 3/8 inches, but with the palmation, the outside spread was 20 6/8 inches. The right main beam measured 17 6/8 inches, and the left beam was 20 4/8 inches. The circumference at the base was 4 4/8 inches for both main beams. The palmation stretched the circumference of the main beams to 3 7/8 inches between the third and fourth points up to 5 inches between the second and third points on the left antler all the way to 5 2/8 inches between the third and fourth points to 6 4/8 inches between the second and third points on the right antler. Taxidermist Donnie Simpson said he realized he had a very unique deer to mount as soon as he saw it. “It hit me immediately that this was an extremely impressive rack. It is very big and the palmated beams are as wide as my hand,” Simpson said. “It is a fantastic deer. I had never seen one with that kind of palmation before. Boy, am I ever blessed and extremely lucky to kill that animal,” he said.